Product #21918 | SKU TS16GDP200 | 0.0 (no ratings yet) Thanks for your rating! 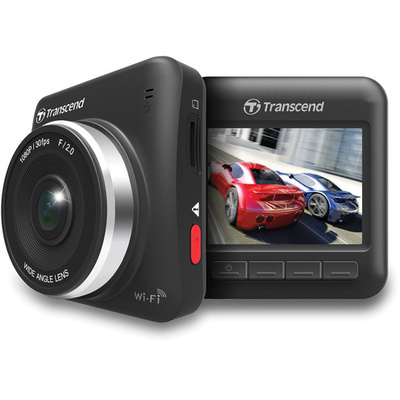 Capture and save valuable video files with Transcend's DrivePro 200 Wi-Fi Dash Camera. It utilises a 3MP CMOS low-light sensitive image sensor to capture 1920 x 1080 high-res video at 30 fps, for playback to the on-board 2.4" colour LCD screen, TV or computer. A built-in microphone can capture cabin audio, or it can be disabled to protect passenger privacy or to conserve memory. The camera generates its own Wi-Fi signal to directly connect it to an enabled Android or iOS device with the free app installed. Users can view, download, and share saved files using their mobile device. This makes sharing scenic views on social media faster, and can expedite police reports or insurance claims. Users can also delete videos and change camera settings. Recording begins automatically when the unit is turned on, and automatically overwrites the oldest unprotected files first. Video is saved to the microSD slot that supports cards up to 128GB - a 16GB card is included with the camera. You can manually mark a file with overwrite protection, and if an accident is detected, the current file plus the ten seconds immediately before and 50 seconds after the incident are automatically protected. An auxiliary RCA video-out port and included cable can be used to view files on a TV or monitor.